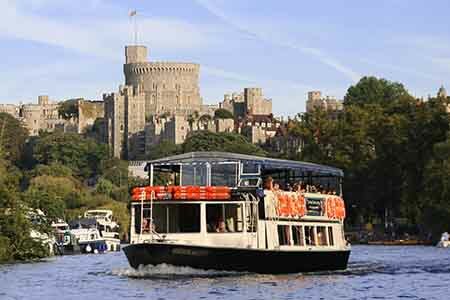 Travel from Windsor upstream to Boveney Lock and return, with views of Windsor Castle, Eton College, Mill House, Windsor Racecourse and Brocas Meadows. Boat turns at Boveney Lock and Weir. The view of the Castle from the river is undoubtedly the finest there is, making this trip excellent for those who are visiting Windsor for the first time. The length of the trip makes it popular with children, with The Home Park close by providing excellent playground and picnic facilities. Particularly suitable for those packing a lot into their itinerary, as boats depart frequently throughout the day. A printed leaflet is included with your tickets, giving historical and other information about the river and its surroundings along which you will be cruising. * Out of peak season, trip will run subject to river conditions.